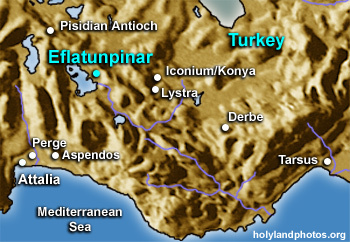 Eflatunpinar is located about 50 mi. [80 km.] due west of Konya (classical/biblical Iconium). At Eflatunpinar (Eflaltun Pinar) there is a spring and a very well–preserved Hittite monument that seems to date to the second half of the thirteenth century B.C.—to the reign of the Hittite king Tudhaliya IV (ca. 1259-1229 B.C.). The monument is a "spring head" that feeds a pool that measures 110 ft. x 100 ft. (34 m. x 30 m.). Eflatun Pinar means "lavender-colored spring." It is actually very possible that the Apostle Paul stopped at this wonderful spring twice as he traveled from Pisidian Antioch to Iconium and back on his first journey (Acts 13:5; 14:21), and as he probably traveled from Iconium to Pisidian Antioch on his second (Acts 16:4-6) and third journeys (Acts 18:22-23). For an online source of information Click Here.